This is the second time I write this blog post... When I had just about finished it the first time my anti virus program flashed a popup promting me to restart the computer. As I was writing when this happened, one of the keys I pressed restarted the computer without me having any time to do anything about it. About 5-6 hours of work was gone... even though I had pressed save many times. I hope I can manage to write everything again. Well, in any case. 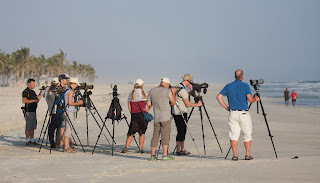 This blog post takes us back to the first day (the 16th) of the birding trip in Oman again. After a long night's flight, an early morning birding tour of the hotel garden and its proximity and an hour and a half of sleep, the group got together by the cars. 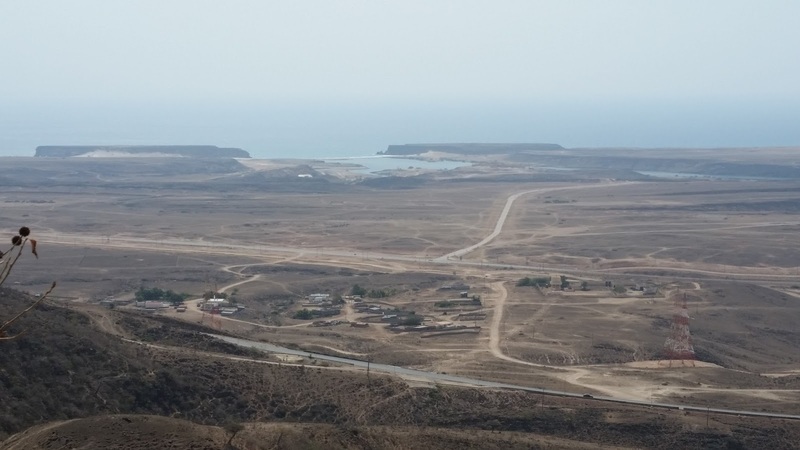 The plan was to drive to the large Khawr, in the eastern part of the Salalah area, called Khawr Rawri. We headed off for the Khawr but stopped for supplies. We bought bananas and other fruit at some fruit stands by the road. By the way, the bananas are something different than what we have in sweeden. The short, sweet ones were very nice. Also they were grown just beside the stands. We also filled up with water, bread and some nuts. But a tip here is to bring salty nuts from home. I didn't find any in the small shops and as you sweat a lot it's a good thing to have while away from the hotel. 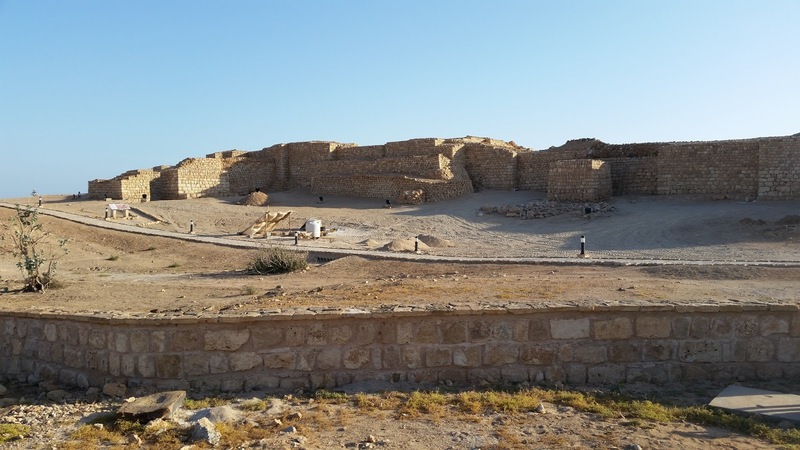 Some 30-40 minutes drive to the Khawr and as it lies within the area of a world heritage site, there was an entrance fee. Not expensive though. The hole Khawr Rawri (or Khor Rori or Khawr Ruri or whatever it is called) used to be an ancient port, important in the trading of the frankincense and the ruins of the town Sumhuram are still left and used as tourist attractions. 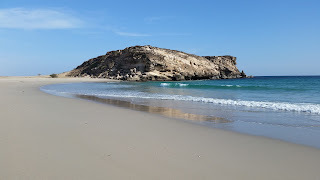 We drove down the eastern side of the Khawr, almost all the way down to the beach. Here we got our scopes out of the car and started birding for real. Though we had already seen both Cinnamon-breasted Bunting and Eastern Imperial Eagle on the way down. 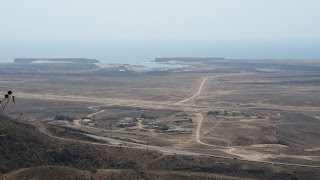 The photo shows Khawr Rawri, in the distance, and part of the plane land between the Dhofar mountains and the Indian Ocean. The photo is taken from the road to Wade Darbat. The Khawr lies with only a thin strip of sandy beach separating it from the ocean. It can be seen between the two "mountains" (for lack of better word) just by the ocean. While our tour guide payed the entrance fee on of the group (I think it was my dad, in fact) found the first Cinnamon-breasted Bunting for the trip. 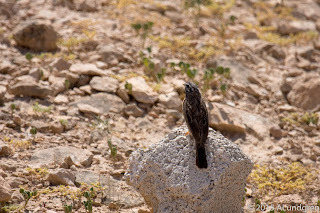 As always, the first bird of a species is always special and at this point we didn't know that it was very common in the Dhofar mountains. The first raptor lifer for the trip turned out to be this Eastern Imperial Eagle, which showed itself on the way down to the beach. Even though there was a lot of birds down at the Khawr, the photo opportunities were few. The sun was not in our favour and many of the birds were quite some distance away from us. But is was really nice anyway. 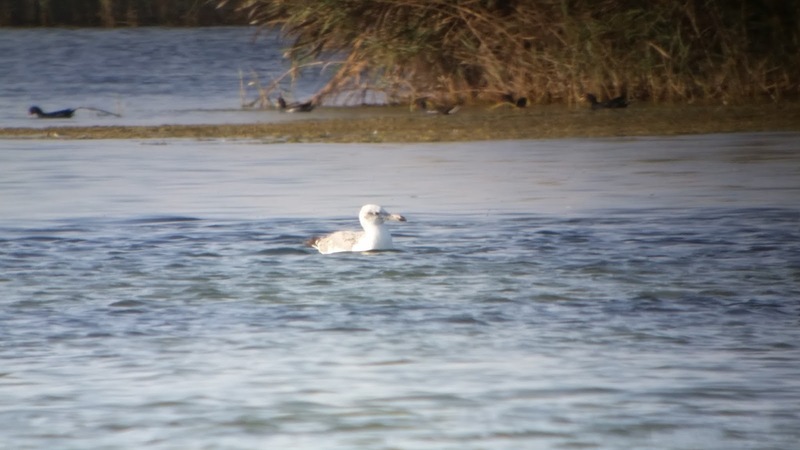 Slender-billed gulls flew back and forth between the Khawr and the ocean, as did the Saunders's Terns. Some in the group saw an Intermediate Egret, which I missed. Or... I might have seen it but I couldn't really say that it was an Intermedieat. 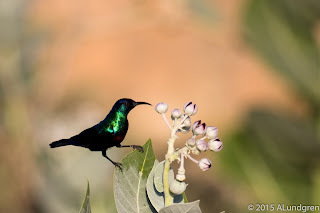 With no other birds to tell the relative size and never having seen it before, well... I'll see it some other time. Though I think it was the only species seen by the group, that I missed, which would have been a new lifer for me. No, there were probably a few more... I think I wrote about a Jouanin's Petrel in the first post of the trip to Oman. Never mind. It was a very nice afternoon down by the Khawr. 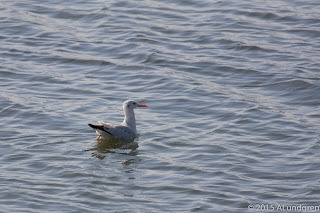 A quite common species along the coast. This was the first sighting for me though. After some time in the sun we went down to the beach for a swim. Warm water, nice waves and a deserted paradise beach. It couldn't get much better than this. Also perfect timing after the flight, lack of sleep and the heat while birding. Really nice!! If one would go to Oman with the family, I cannot think of a better place to go to. About 500 meters of perfect, pristine beach, which goes even further in the other direction compared to the photo. Not a single person to be seen. After cooling ourselves in the Indian ocean for a while it was time go move a short distans. We drove back up to the ruins of Sumhuram where we wanted to look for Blackstart, in particular. Well, it turned out to be easy to find the Blackstart and took a walk around the ruins to check them out a little bit further. 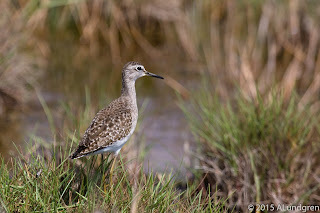 A very nice featuri in birding trips like this one, to also be able to visit a world heritage site. A nice walkway is going around the ruins of this city. 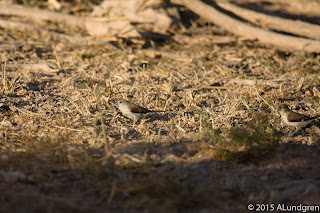 Not only the Blackstart but also Desert Wheatear, Isabelline Shrike and a couple of other species could be seen. If you want to know more about Sumhuram follow this link. Back at the parking lot, I was one of the first and while we waited for the rest of the group to catch up, one of the others in the group and I went a little closer to small busher close by. A few birds could be seen feeding there. 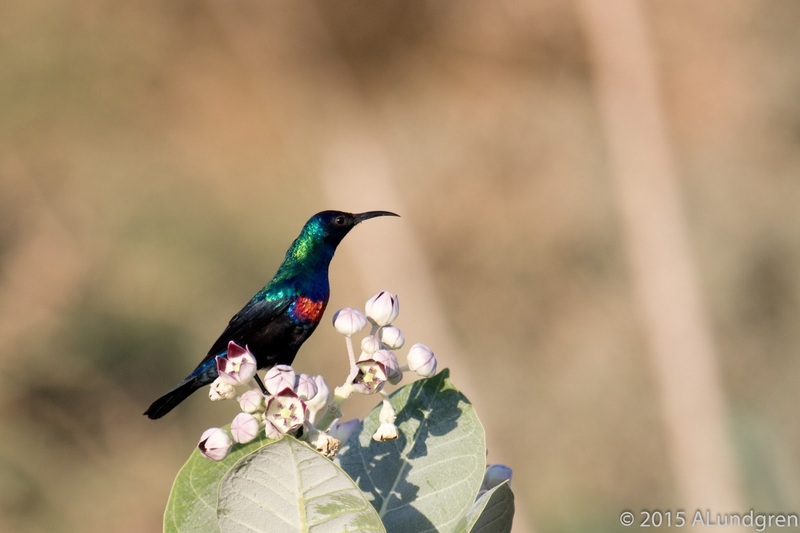 A nice male Shining sunbird, which didn't seem too bothered by our precence, and a couple of African Silverbills found something to eat on the ground. The main target species in this part of the Khawr was the Clamorous Reed Warbler, which could be heard here and there in the reed. 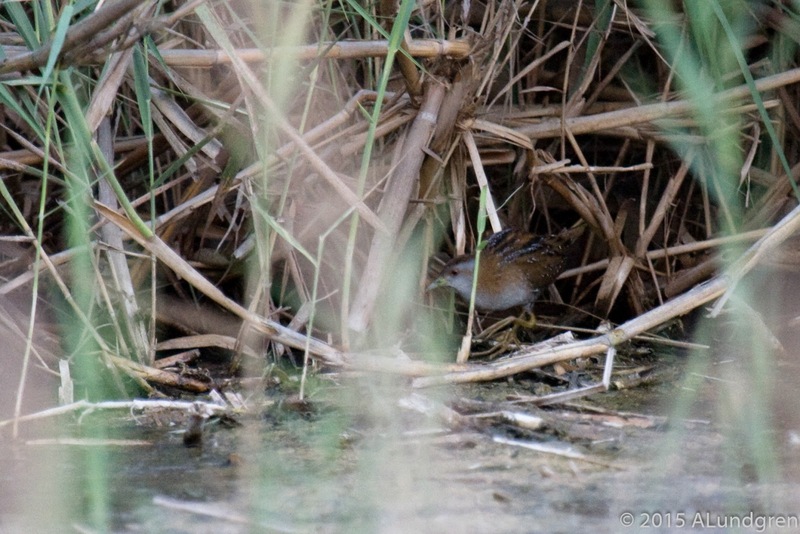 A Baillon's Crake was a nice addition to the list and the first Chiffchaffs of the trip were seen. 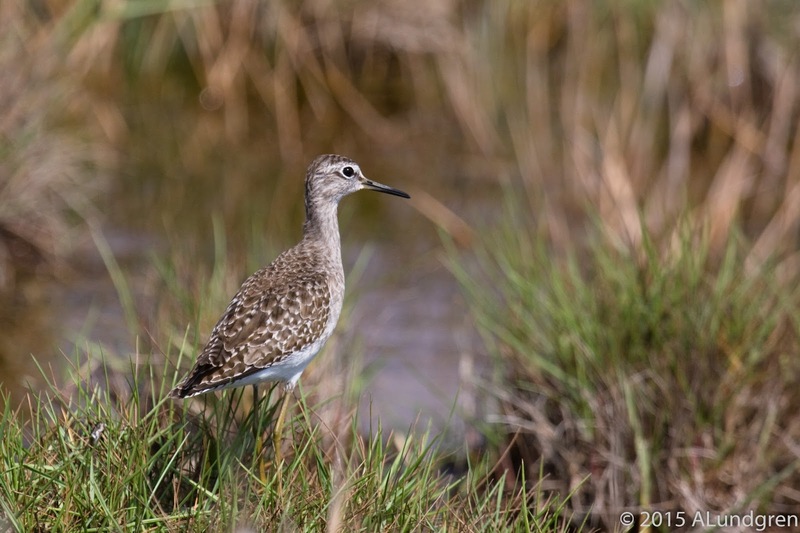 Some of the group flushed a Pin-tailed Snipe but at least, this was one species I had already seen in UAE. 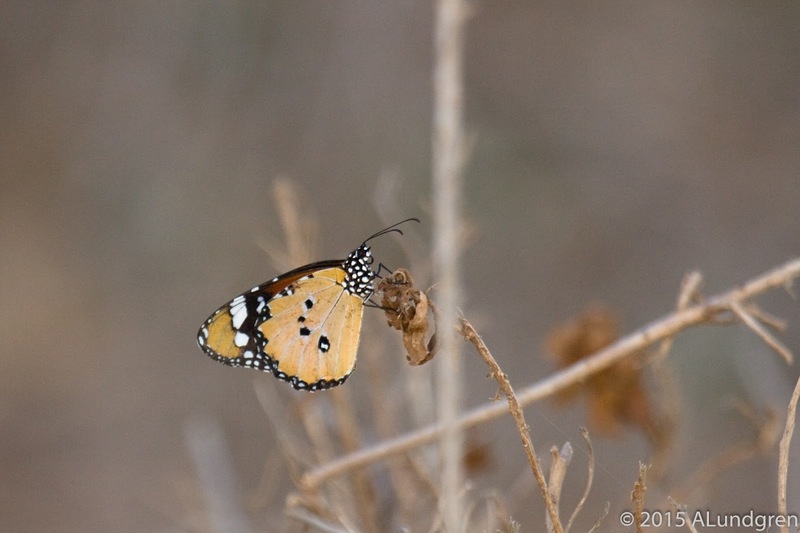 The first African Monarch was also a nice find. 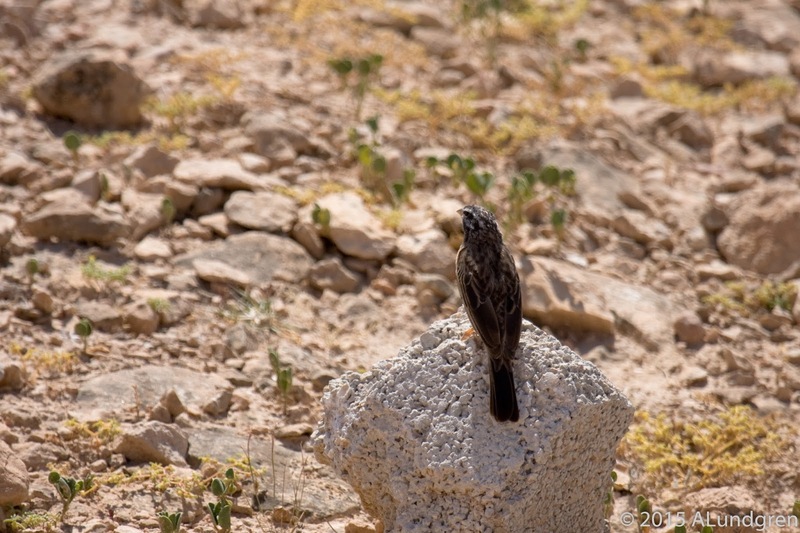 It turned out to be relatively common, in particular in Ayn Razat, where we saw several dozen. Beautiful butterfly! That was it for Khawr Rawri and we didn't go back to this place again during the trip. At least not while I was in Oman. As we were flying from two locations, Copenhagen and Stockholm, we didn't go home on the same day. I was flying to Copenhagen and we had to leave a day earlier than the ones going to Stockholm. These guys went back to Khawr Rawri on the extra day they had. I heard that they had seen Scrub Warbler during this visit. 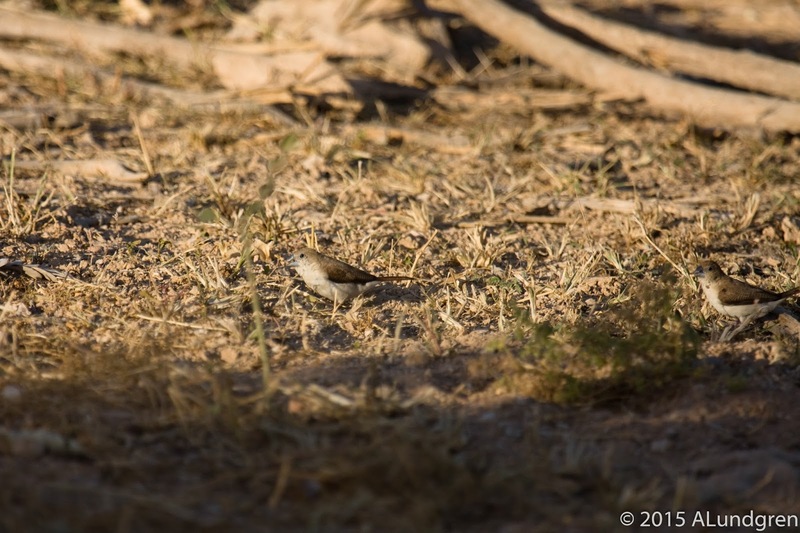 It would have been nice to see but at least a bird I have seen before (link to blog post in which I have photos of Scrub Warbler) in the UAE. Next Khawr i want to write about here is East Khawr, or Khawr ad Dahariz as it says on google maps. We went to this site three times (at least the car I was riding in), on the 18th, the 22nd and the 24th. East Khawr is easily accessed by the road going between the ocean and the Khawr itself. This is also the best place to put your scopes up as the edge of the Khawr to the road is good for shorebirds, herons and ibisis etc. Another part of this site which should not be missed is the beach over at the ocean. It is only a short walk to the ocean. 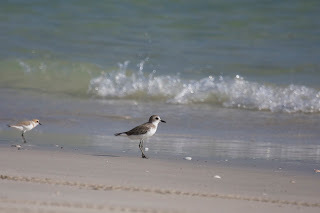 The reason for three stops at this site was partly due to the easy access but also partly because we had been told that there was a Long-toed Stint there. We thought we saw the stint for a short while during the last visit but it wasn't a good view and then the hole group of stints was flushed and we couldn't find it again. That one will have to wait for another time. 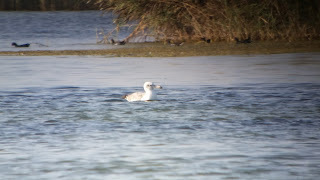 Even though there were quite a lot of species at East Khawr, Garganay, Reef Heron, Cattle Egrett etc. 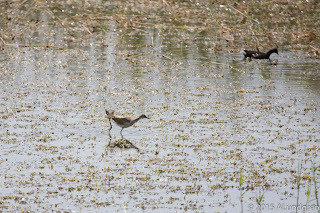 only one new lifer was seen here during the first visit. 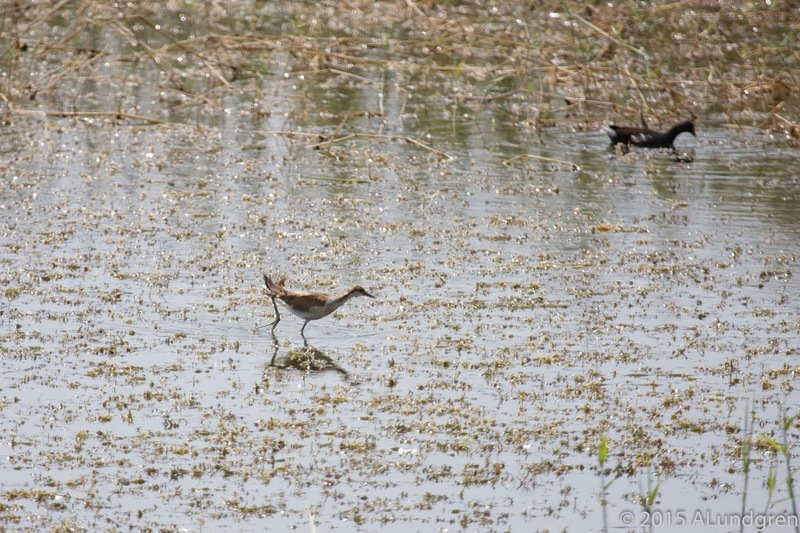 This was a Pheasant-taile Jacana, which I managed to spot myself. 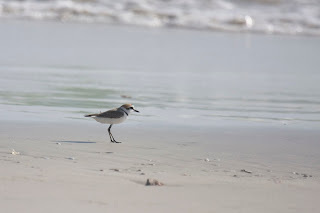 A Broad-billed Sandpiper made up, to some extent, for the non existing Long-toed Stint (it wasn't until the last visit we had that short sighting of what could have been it), Temmink's Stint, Saunders's Tern and Lesser Sand Plover were other species seen there. Link to map showing East Khawr. 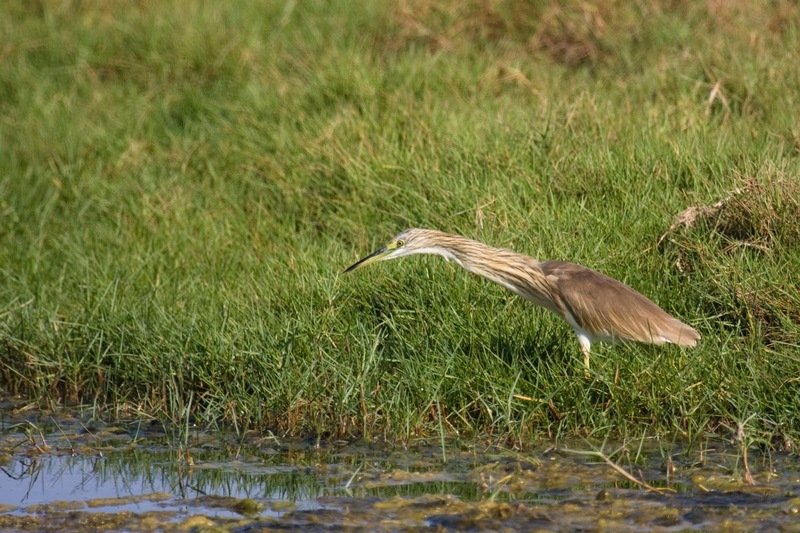 Squacco Heron was common but distiguishing it from Indian Pond is not very easy. We believe that most of the Squacco/Pond Herons we saw were in fact Squacco and we only had one individual which we was certain was an Indian Pond. There were Sooty gulls all along the watchtower... I mean shoreline. Both on the first and the last visit, we went down to the beach. 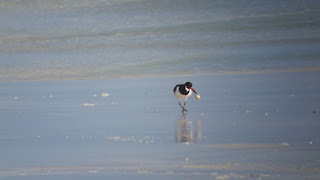 A few Lesser Sand Plovers could be seen here and Eurasian Oystercatcher in winter plumage, but it wasn't until the last visit that we saw the two Greater Sand Plovers. Kentish Plovers were common on the ocean beach and by the Khawrs. If you take your time, I sure you could have managed to get real closeups but I never took the time to do that. 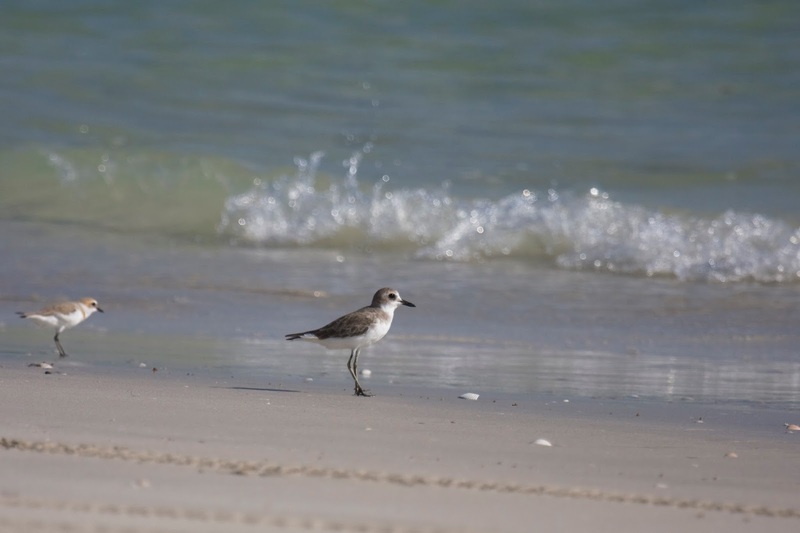 In the end, there it was, the Greater Sand Plover. 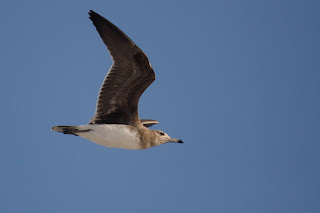 I had seen it a couple of times in the UAE but it's still a nice bird. Part of the group of Swedish birders who was on this trip. By this time I imagine that many where quite tired after almost ten days of birding and many early mornings. 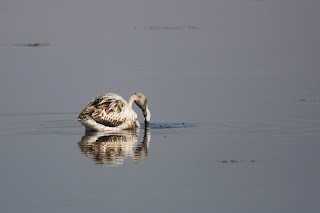 Another try with digiscoping. 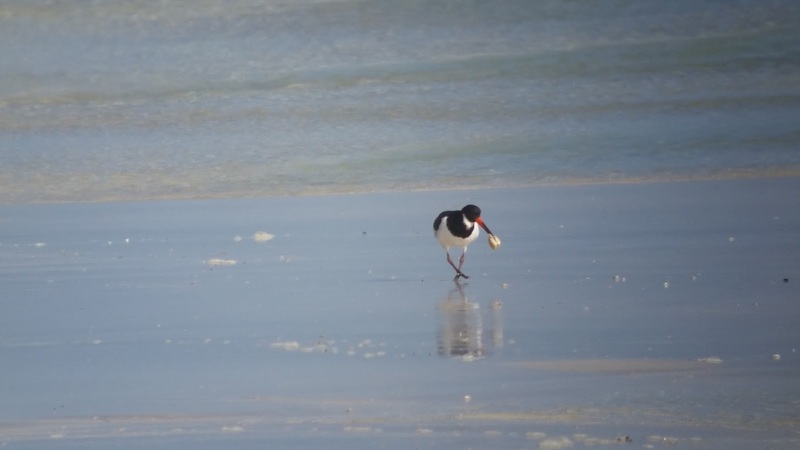 An Oystercatcher of what used to think was a different sub species but rather is the winter plumage... I have not really studied longipes or osculans or whatever one might expect to see. The last visit to East Khawr was also one of the last sites we visited while we were in Oman (except for the ones flying from Stockholm of course) and we were trying to get the last few species to reach 200 for the trip. Not that we took it very seriously but it seemed a nice number to reach and one none in the group thought we would reach. So, as we searched through the birds, we found a Pied Avocet, first for the trip and just when it was time to leave, Magnus called out and said he saw a new species for the trip. A Pallas's Gull. This also became the last lifer for me on this trip. 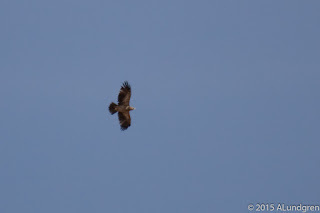 Not that it is particularly beautiful - at least not compared to the Verreaux' Eagles we saw - (in another blog post...) but still really cool. If I'm not mistaken, this must be a 1cy bird. The third Khawr we visited - or perhaps tried to visit is a better sentence - was Khawr Taqah. This was on the 20th. Unfortunately is was very exploited and the entire nort shore was made into some kind of park, which was closed. The southern side was almost completely blocked by reed which made the spots with open water both few and small. We soon gave up and drove on towards Wadi Darbat instead. We did see the first definite Southern Grey Shrike here though. 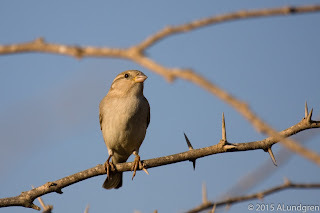 We had seen a grey Shrike before but I'm actually believing that it was a Steppe. But as that is a subspecies of Southern Gray, at least according to some lists, well I think I'll just let that one go. It's time to wrap this blog post up. 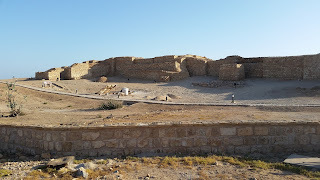 The two large Khawrs, East and Rawri are really worth a visit. 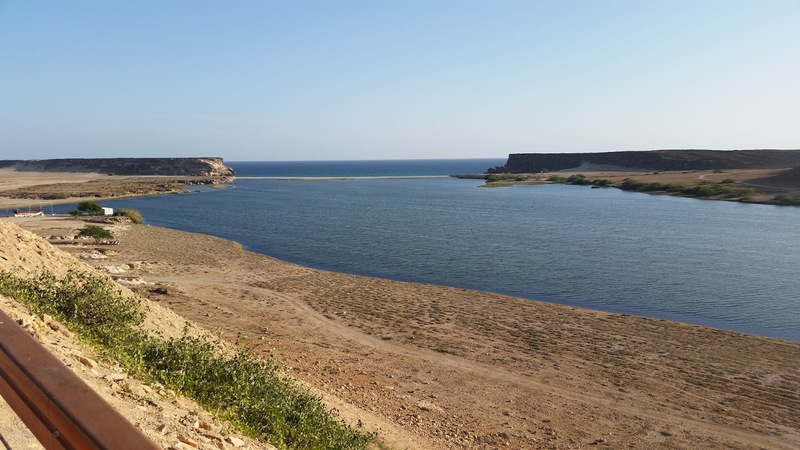 If the park at Khawr Taqah opens up it might be a bit easier to go birding there compared to when we tried. There are also quite a few more Khawrs which probably are good as well. Many seem to be quite exploited with a lot of the natural water front (reed etc. ) being concrete or whatever. Too bad. New lifers for me are marked with * in the species lists below. Clamorous Reed Warbler (papyrussångare, Acrocephalus stentoreus) * Though I very probably saw one at Dubai Pivot Fields last year.